The new QuickSearch function in NetBeans 6.5 also allows us to search for options from the Options dialog. Suppose we want to set formatting options we only have to type this in the QuickSearch field. 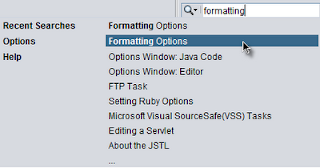 NetBeans shows at the Options section the Formatting Options choice. We select this option and NetBeans will open the Options dialog window at the correct location.